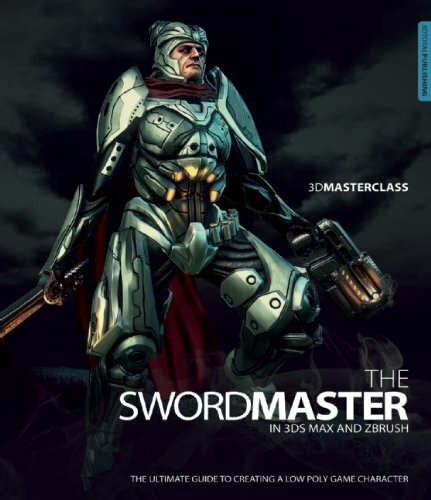 The Swordmaster is a step-by-step tutorial guide at creating a game character. It's written by Gavin Goulden for those who use 3ds Max and ZBrush. There are six chapters from start to finish. First chapter covers the modelling of the base mesh in 3ds Max. Chapter 2 covers the high poly model with ZBrush. This includes creating details for the face, armour and weapons. In Chapter 3, using the previous model, a low res game character is being created. Chapters 4 & 5 covers UV mapping and texturing. Last chapter in on weighting the character to prepare it for posing. The instructions and screenshots are clear and easy to follow along. There's a lot to be learned about the process, such as working on files from other software, and the workflow of the game design industry.Tutorial files are also available from the 3DTotal Publishing website. The book is aimed at the intermediate to advanced users. You should have some basic knowledge of modelling to get the best out of the book. This book's a review copy from 3DTotal Publishing.